It makes perfect sense why publishers would want to milk the legacy of classic games as long as they can. Why wouldn’t they? Very often for a lot of these retro releases they’ve withstood the test of time, being sold to generation upon generation without any sign of stopping. Bandai Namco is the king of that practice, having delivered us hundreds of Pac-Man ports, re-releases, and spinoffs in the past several decades. But what I love more than a port is an original take on a classic formula. When you start putting your games on basically every platform known to man, there’s a point where the tactic feels cheap. This is especially the case on mobile, with retro titles being dumped onto the platform for the masses to buy with non-optimized control schemes, and of course, a complete lack of future updates, turning the app into an obsolete icon over time. While the update situation remains to be seen, Galaga Wars (Free) doesn’t feel like a quick cash-in. Yes, it is a free-to-play game, and yes, it uses those “watch videos to continue" schemes, but hear me out. 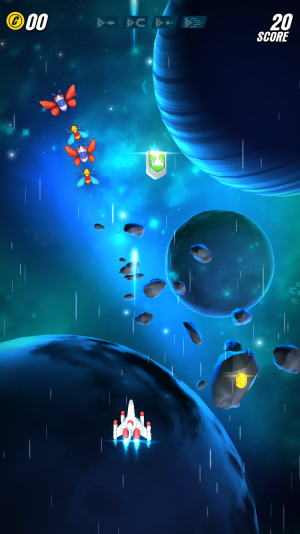 Galaga Wars, like many other successful touch-based shoot ’em ups, uses the finger slide scheme for your ship, with automatic shots enabled. It’s something everyone can pick up and play on their first attempt, and the always great “auto-pause if you lift your finger" mechanic is welcome. And that’s really all you need to know, as this is as classic as it gets, minus the addition of some power-ups. 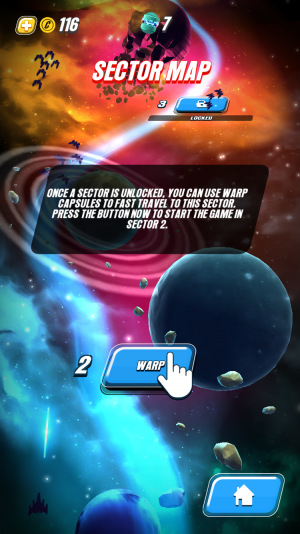 You can bring in another helper ship to fire off extra shots if you rescue it from an enemy bug, and mostly line-centric waves can fly in from any direction on-screen. That same strategy of lining up shots and standing still to mow down the mostly ordered waves still works, but naturally as time goes on, more enemies will fill the screen and make things that much tougher. There’s also some Space Invaders type formations that appear starting from the second level. It’s fun, fast, and easy to run just “one more round" on, especially with the exciting power-ups that pop up that grant extra firepower, as fleeting as they may be. Note that there isn’t a whole lot in terms of strategic depth though, even in the form of getting deliberately captured by the enemy and escaping to grant yourself an edge — something the original had going for it. So about that IAP I mentioned earlier? It’s not so bad. Firstly, you can play for free, and if you die, you can choose to expend 100 coins (a sum garnered over roughly two or three playthroughs), or watch a short video to go on. Then there’s a coin bonus box that regenerates every six hours or so, a daily mission to complete that rewards 300 coins, and the chance to watch ads to skip ahead to areas you’ve already completed. If you’re so inclined, you can spend $1 each on 3 additional bonus ships (that pay homage to other Namco titles like Galaxian or Xevious), which removes static ads from the equation. There’s also a welcome pack that’s available for roughly two days that does the same thing, gives you a bonus ship, and grants you a 1000 coin bonus for $1. Oh, and there’s a coin doubler for $2.99. I didn’t feel like I was being pinched at any time, and there’s no energy system afoot. Instead I could play as much as I wanted, and often times I’d get pretty far and find myself with a hefty amount of coins. 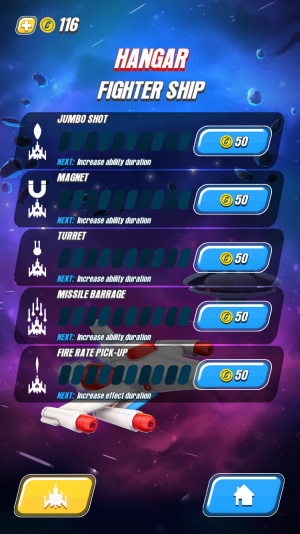 Coins, mind, that can be used to unlock those aforementioned areas (when used in conjunction with warp cell items, or, watching video ads), or upgrade your ship with various power-up boosting abilities (think Jetpack Joyride (Free)). I know, it sounds like it’s predatory on paper, but it’s not. The lack of an energy meter is mostly what drove me to keep playing, and if you’re skilled enough, you can get really far without having to rely on a gold meter to continue. It would have been great if there was an option to buy the game outright for $6 (the price of all three current premium ships and the doubler), but there was nothing to directly impede my progress. If you’ve given up on trying out every single version of Galaga that’s released multiple times a year (it’s even in the NES Classic Edition micro-console that Nintendo just put out this week), now is the time to get back in. If you end up not liking the monetization system on principle that’s fine, but you’ll probably have a lot of fun before you reach that point.